All our Organic Teas have Organic Handling Certificates by SAI Global, covered by equivalency agreements between COR (Canada), NOP (United States) and EU Organic (Europe). What is HACCP? This is a program that was originally designed for NASA and the US Army Laboratories to provide safe food for space expeditions. It is now internationally recognized as the best system to ensure food safety and is endorsed by the Food and Agricultural Organization and the World Health Organization. 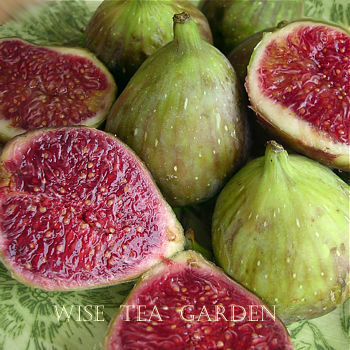 ORGANIC GREEK FIGS - a great pairing for a White Tea. Photography © WISE TEA GARDEN® Basic principles of how organic tea grown: • Abstinence from using any synthetic fertilizer or pesticide • Protection of the environmental integrity of lands surrounding the gardens • Minimize pollution and optimize biological productivity • Replenishment and maintenance of garden soil fertility • Promotion of biodiversity in and around the tea gardens, includes working to protect natural wildlife habitats. Camellia sinensis (tea plant) is environmentally sensitive crop, therefore all our tea products meet EU/ USA/ Canada/ Japan specifications for agricultural inputs or pesticide free. Our Organic Teas are packed at a HACCP* certified facility and have certifications of CFIA COR (Canadian Organic Regime), USDA NOP, and/or EU Organic Farmers and Growers (OF&G). Also, all teas, including organic must be able to pass the CFIA, USFDA or EFSA certifications. Products of Canada. 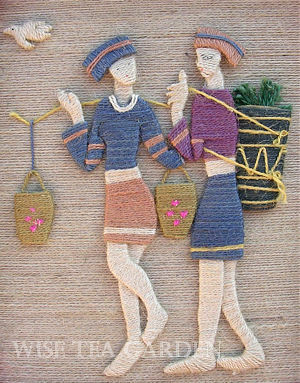 Fair Trade and Ethical Partnership certified. Canadian Food Safe guarantee. WILD TEA is extremely rare. Tea trees on such plantations are usually planted by man, but "they are much more natural than organic plantations on which farmers are active to fight against the invasion of other plants." That's why this kind of plantation are called 'semi-wild'. Source: Tea Masters Blog ». NATURAL TEAS are grown on estates, which do not use pesticides or herbicides because pests that typically damage tea crops are not found at their high altitudes. Instead, the estates use nitrogen (N) as a natural fertilizer making them almost organic by default.